Each year the North Plains Groundwater Conservation District invites 4th-6th grade students in the district to submit their best artwork on the subject of water conservation during the Water Conservation Calendar Contest. The competition is held in order to select the 13 winners to be included in the following year’s calendar, produced by the North Plains Groundwater Conservation District. Students are asked to draw a picture of a way to conserve water and to be as creative as they like. The more colorful the artwork, the better! Artwork drawn in pencil will be disqualified because it is difficult to see once scanned into the computer. The artwork requires landscape mode on 8.5″ x 11″ paper so that it is longer than it is tall. Artwork submitted vertically will be disqualified. Artwork should involve water conservation as its main topic. First place will be awarded a $50 prize and the winning artwork will be featured on the cover of the calendar. There will also be 12 monthly winners, each monthly winner will receive $25 and their drawing will be featured on one month of the calendar. To download the Water Conservation Art Contest Form, click here. Make sure to turn the form in with your artwork. 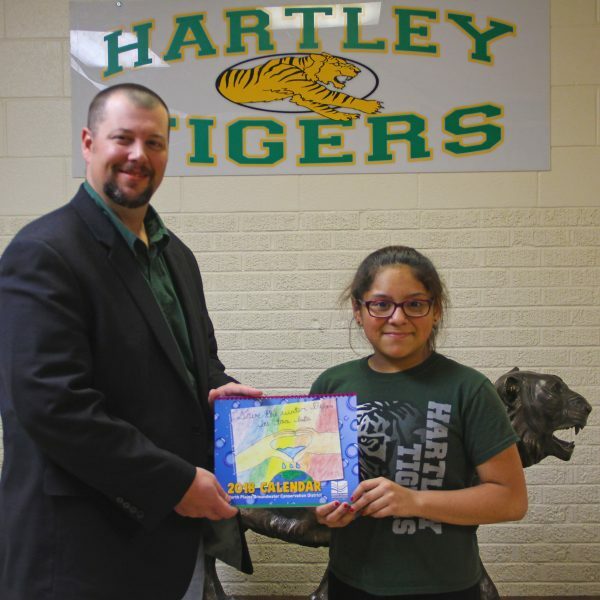 Principal Kurt Koepke presents Christy Hernandez Zamarrippa with the 2018 NPGCD Water Conservation Calendar with her artwork showcased on the cover. Christy Hernandez Zamarrippa from Mr. Smyth’s class in Hartley, Texas is the grand prize winner in the 2018 Water Conservation Artwork Contest sponsored by the North Plains Groundwater Conservation District. The annual contest is open to all fourth, fifth, and sixth grade students who reside within the district. Christy’s artwork titled “Save Water” shows two hands in the shape of a heart a rainbow background with water dripping onto the earth below. Christy received her original artwork in a frame, a $50 cash prize, and her artwork is featured on the cover of the 2018 North Plains Groundwater Conservation District Water Conservation Calendar. Christy was in Mr. Smyth’s class from Hartley School in 2017 when the entries were submitted. The calendars are free to the public. Jaron M. Schriber – artwork titled “Don’t Leave Us Running”. Jaron was in Mrs. Olson’s class at Dalhart Intermediate School in Dalhart. Yunidiana Rojas – artwork titled “The Water Cycle”. Yunidiana was in Mrs. Olson’s class at Dalhart Intermediate School in Dalhart. Caitlyn Gatlin – artwork titled “Earth Day”. Caitlyn was in Mrs. Mason’s class at Hillcrest Elementary in Dumas. Vriyhana Pizarro – artwork titled “Water Hog”. Vriyhana was in Ms. McOmber’s class at Hillcrest Elementary in Dumas. Caitlin Admire – artwork titled “Ways You Can Conserver Water”. Caitlin was in Ms. McOmber’s class at Hillcrest Elementary in Dumas. Gisselle Lopez – artwork titled “Don’t Waste it! Save it!”. Ashley was in Mrs. Resnick’s class at Sunset Elementary in Dumas. Adrian Rivera – artwork titled “Don’t Fill Your Pool Everyday”. Adrian was in Mrs. Holzworth’s class at Morningside Elementary in Dumas. Elli Bezner – artwork titled “Donut Let Any Water Go to Waste”. Elli was in Mrs. Kaul’s class at St. Anthony’s School in Dalhart. Diego Padilla – artwork titled “Let’s Take Care of Water!”. Diego was in Mrs. Kaul’s class at St. Anthony’s School in Dalhart. Judd Daniels – artwork titled “Slow the Flow, Save H2O”. Judd was in Mrs. Kaul’s class at St. Anthony’s School in Dalhart. Lauren Welch – artwork titled “Stop that Drippin’”. Lauren was in Mrs. Kaul’s class at St. Anthony’s School in Dalhart. Karol Garcia – artwork titled “Save H2O”. Karol was in Mrs. Kaul’s class at St. Anthony’s School in Dalhart. These students received their artwork framed, a $25 cash award, and their artwork is featured inside the 2018 Water Conservation Calendar. Additionally, each student received copies of the calendars to share with friends and family. The water conservation calendars serve as colorful reminders of how we can be better stewards of our water throughout the year. The calendars are available to the public at no cost at the North Plains Groundwater Conservation District office at 603 East 1st Street in Dumas, and at water utility offices in each town within the district. You can also request copies of the calendar by calling the district office at 806-935-6401. The district would like to thank all the students who participated in this year’s contest. We also appreciate the parents and teachers who encourage their students to enter this contest each year. It is an excellent way to challenge students to think about ways they can conserve water, while allowing them to communicate a water conservation message to others through their art. Artwork for the 2019 calendar is being accepted. Send artwork on 11X8.5 (landscape view) to NPGCD at PO Box 795, Dumas, TX 79029 or drop it off at the office at 603 East 1st Street, Dumas. Any 4th-6th grade student who lives within NPGCD’s service boundaries is invited to participate. These students will receive certificates of appreciation, a $25 cash award, and will have their artwork featured inside the 2017 Water Conservation Calendar. In addition, each student will receive copies of the calendars to share with friends and family. The free water conservation calendars serve as a colorful reminder throughout the year of ways that each of us can be more responsible for our water resources in the little every day actions that we can take. The calendars will be available at the North Plains Groundwater Conservation District office at 603 East 1st Street in Dumas, and also at water utility offices in each town within the district. You can also request copies of the calendar by calling the district office at 806-935-6401. The district would like to thank all the students who participated in this year’s contest. We also appreciate the parents and teachers who encourage their students to enter this contest each year. It is an excellent way to challenge students to think about ways they could conserve water, while allowing them to communicate a water conservation message to others through their art.